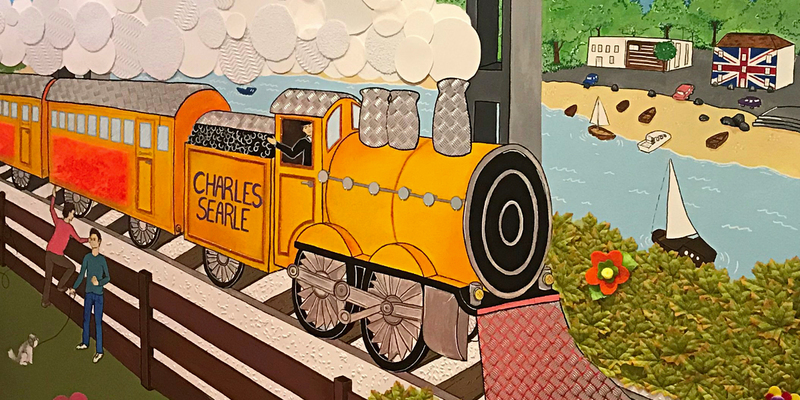 In this post, Claire Bennett, a Team Leader at Beyond Limits, explains how Charles’s mural came about, how it was created and how long it took. “I was approached by the team about creating the mural and helping with some sensory work. I was given a simple brief consisting of Charles loving trains and the Tamar Bridge. As I started creating a design, more information came from the team concerning having the water visible as he likes water and boats. They also sent a few ideas of trains and Charles’s mum asked about having the family dog on the mural as well ! The final design took into account people suggestions, Charles’s likes and dislikes (definitely not having too much red), and his needs. When the team and Charles’s family had agreed the design we showed it to Charles. It took a while but that was down to me having limited time, It took between 40 – 50 hours over about 5 months to get it drawn, painted and have all the sensory elements attached. The wall was done slowly due again to myself, but Gayle and the team said doing it slow would be better for Charles to process it as having a whole painting done at once may be a bit overwhelming for him. Small sections were done during each visit with acrylic paints as they are easier to paint over rather than wall paints and they were easier to clean. The sensory elements were created at home and then brought in ready to put up as it involved a lot of space and a lot of mess! I tried to add a different variety of textures as well as smells. His felt flowers have Lavender oil on them and Sandalwood. There were also some battery operated lights and mirrors as well as some reversible mermaid sequence fabric. I tried to make it safe as I was aware Charles has drop seizures and at times will throw things that are accessible to him. Darren (support worker) had some good suggestions like adding Charles’s name on the train so he took ownership of it, and having the train orange as it was his favourite colour.